The BioTek Microflo Select Reagent Dispenser brings a self-contained, universal microplate dispenser that’s programmable and adjustable. This plate dispenser can be adjusted for height and volume, so it can accommodate all standard and deep well formats, even test tubes under 4 inches with the use of a special carrier (sold separately). The Microflo Select is outfitted with a 1uL cassette but can be changed out allowing you flexibility in volume. This microprocessor-controlled reagent dispenser has an onboard computer that saves your 10 most commonly used protocols in quick access and will hold up to 99 user defined programs in memory, or simply dispense straight away for most common applications. The parameters such as volume, flow rate, plate type and maps are set from the digital, membrane keypad interface and can be adjusted as needed. This microplate dispenser can also be controlled through a PC for added automation. The BioTek Microflo Select Reagent Dispenser is Biostack compatible or could also be paired with the Biostak twister II microplate handler. The peristaltic pump of this plate dispenser can draw from up to 8 different supply bottles into various vessels and uses 4 rollers over which tubing is stretched. All tubing for this reagent dispenser is autoclavable at 121°C, 1barr, and can be sanitized with 70% ethyl or isopropyl alcohol and 0.5% sodium hypochlorite (bleach) solution. The plate carrier and priming trough of this microplate dispenser can also be easily removed for cleaning. Biotek washer can be purchased directly through the website. 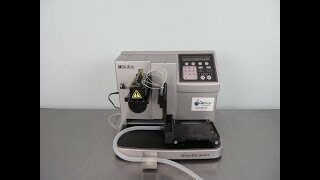 This BioTek Microflo Select Reagent Dispenser has been fully inpsected and is operating without issue. Please note this dispenser does come with a cartridge, however a bottle is not included. All of our lab equipment comes backed with our standard warranty. Should you have any questions, please don't hesitate to contact us.